This is a favourite breakfast dish in my household. Pre-heat oven to 200C. Heat oil in a pan and cook garlic till golden. Add tomatoes, salt to taste and cumin, cover with a lid, reduce heat and cook for 10 minutes until soft. 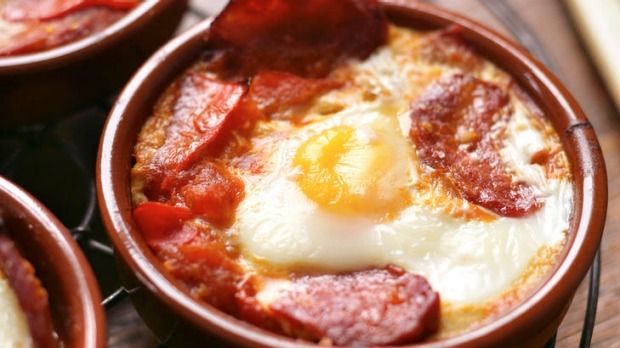 Spoon tomatoes into individual baking dishes with some sliced chorizo, make a well in the middle and break one egg into each dish. Sprinkle a little salt over the egg and place in the oven. Cook for about 10 minutes or to your liking. Serve at once with a sprinkle of parsley.